InspiRE is the first Key Stage 3 course that lets you to teach RE both thematically, and/or, by religion, giving you the flexibility to deliver lessons however you want. 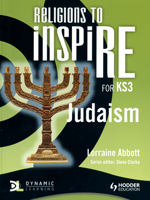 InspiRE comprises two parallel sets of books: Religions to Inspire, seven 'by religion' books that exemplify the themes and expands them from the points of view of the major religions of Great Britain; and Themes to Inspire, three books, one for each year of KS3, that cover the National Curriculum programme of study through an exploration of thematic issues and concepts. The flexibility and customisation that this approach offers teachers and syllabus designers is unique. - Engaging pupil-centred activities incorporate assessment for learning (AFL) and personal learning and teaching skills (PLTS), providing complete and comprehensive coverage of the programme of study for religious education. - Offering clear differentiation with levelled activities referenced against the eight-level scale. These allow pupils to work at their level and understand see what they have to do to progress, along with extension activities to challenge more able pupils. - The 'Big Assignment' at the end of each section provides teachers with formative assessment opportunities. - Provides guidance and support for teachers in the Teacher's Resource Book to help you plan, teach and assess learning. - Features engaging and integrated ICT resources with lessons delivered through our digital platform, Dynamic Learning. - Clear differentiation with levelled activites referenced against the eight-level scale. - 'The Big Assignment' at the end of each section that provides teachers with formative assessment options. 1.1 Who are the Jews? 1.2 What are the Jewish holy books? 1.3 How do Jews worship in the synagogue? 1.4 How do Jews keep the Shabbat Mitzvot? 1.6 What happens when Jews are born? 1.7 How do Jews celebrate Bar or Bat Mitzvah? 1.8 What festivals do Jews celebrate? 2.1 What do Jews believe about God? 2.3 How did Judaism begin? 2.4 Are all Jews the same? 2.5 What do Jews believe about life after death? 2.6 What do Jews believe about creation and science? 3.1 What guides Jewish morality? 3.2 How do Jews treat the world around them? 3.3 What do Jews believe about family life? 3.4 What was the Holocaust? 3.5 What do Jews believe about war and peace? 3.6 What do Jews believe about issues of life and death? 3.7 What do Jews believe about wealth and poverty?